The Other Series is a cross section of paintings that are visual interpretations drawn from my experiences of life and beyond. I love the surreal mix of the real with the unreal when I paint. Art is personal for us all, whether we create or appreciate. As an artist and writer both colour and a storyline are of equal importance to me when producing a piece. I am guided by my imagination, intuition and experiences, which are best served when left open to appreciating the infinite possibilities of life. I choose to use vibrant, warm or blended colours to fill the lines of the images that take shape. Seeing things from a different perspective and with a touch of humour helps keep my art on the lighter side. These are available as Prints (8x10) or Cards (5x7). Please email for current prices, quoting the stock number found beside each item. For quality results a Futura gloss card stock is used in the production of all cards & prints. Each card includes an envelope and is individually packaged in a plastic sleeve. Each print includes back matting support and is individually packaged in a plastic sleeve. Single cards are $3.75 each, but if you order a selection of 4 cards, it is $12.00 Prints are priced at only $8.00 each. This painting is an acrylic on water colour paper & is approx. 18” X 24”. It was painted on a promise to a close friend’s husband before he passed away. I became God Mother to the youngest of their three children. Proceeds of this work are for this child’s future. 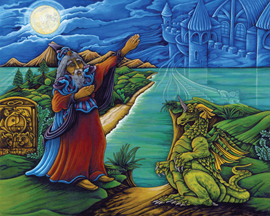 The magician creates “The Castle of Dreams” from the darkness and clouds, so one day it will find ground. The Unicorn Dragon watches him. Behind the Magician is a tombstone combining symbolism with images of animals & man showing us what it takes to persevere through difficult times in our lives – good human(e) thoughts with the strength of a buffalo & courage of a mountain lion, to soar like an eagle and rise above. The infinity sign represents the continuation of life & the yin yang sign reminds us of the balance needed in all we do. This acrylic on canvas is 8” X 10”. 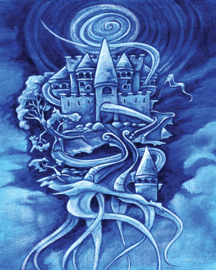 It is a “Blue Painting” – castle in the night air - representing the dreams we all have. Whether it is riches or other hopes for the future – it is a challenge for each of us to make our dreams come true! Sometimes it seems like a swirling hole pulls things out of our grasp, but there are always the roots to hold onto - they help us hold onto our dreams so they don’t fly away. This 18” X 24” acrylic on canvas painting was done after my second trek to Mexico to visit the ruins of the Mayans and other ancient peoples. This site is Palenque in the Lacondonian Rainforest (only remaining one in Mexico – now protected). 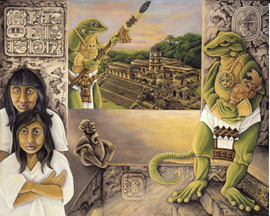 There are two Lacandon Indians in the painting – they are the last survivors of the “real Mayan way of life.” The temple they are in with the lizard guards is the Temple of Inscriptions – which is overlooking “The Palace.” In the upper lefthand side of the painting is Mayan hieroglyphic dating of when I finished the painting & the image (known as a cartouche) on the upper right is an image of Pacal the ruler. The stairs lead down to a burial chamber with a huge carved stone sarcophagus, where Pacal was laid to rest. The lizard guards are dressed reflecting ancient Mayan style & in honour of the son of Pacal who was known as the “Lizard King.” Because it was so hidden away in the jungle, Palenque had very little outside influence. I have included/signed my name as part of the painting – as a glyph at the top of the stairs. The “real thing” I have included in the painting is the clay monkey – which is of Olmec Indian influence. 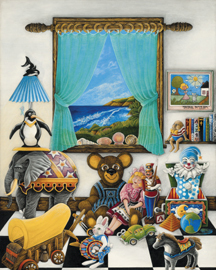 The kids’ room was my first “real painting.” It is a 14” X 18” acrylic on canvas and is done in fine washes – 80+ to get the deep bright colours and detail. In this painting I painted the things I liked when I was a kid, including some of the things that frightened me – which I made friendlier! I always imagined a penguin having a long beak so it could catch fish easier. I also like to add one “real thing” that I have – in this painting it is the covered wagon lamp I got from my Mom. The drawing/painting on the wall is how I drew when I was younger - with what was important to me then (this is where I signed the painting). 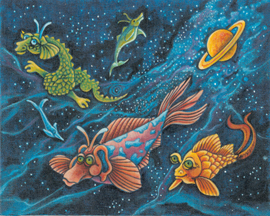 Somewhere over the rainbow, the alien Star Fish drift through space on air currents and frequency waves. All shapes, sizes and colours float endlessly. They have to be on the lookout for nets from passing spaceships and shooting stars. 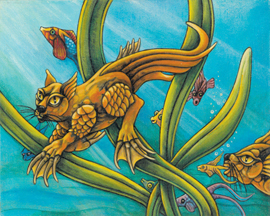 This feline swimmer, the Cat Fish has given up trees for seaweed. Scales have replaced the fur (too heavy when wet). Feathered friends are left behind, but amusement is still found chasing the occasional Water Rat. Catnaps are usually cut short by the pesty Dog Fish. 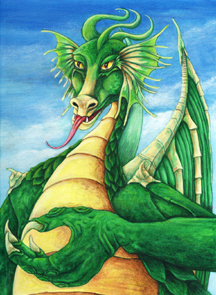 This acrylic on water colour paper is the first illustration for a book I am presently working on, which will be called “A Dragonz Day”. The book will be an illustrated picture book, done in rhyme – 16 lines for each illustration.. 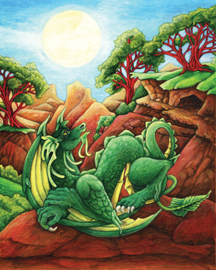 The story is the adventure of a day in the life of a dragon - with some of the magical beings & creations that dragon encounters in its day. The dragon holds his hand open, his claws are relaxed and he extends his tongue as a submissive gesture. This dragon is open to receive and share experiences while testing our trust in him. Communication or giving and receiving need the participation of more than one to be beneficial. In some native cultures the extension of the tongue signifies the passing of power. Help is there for the asking.